When watching movies, you must have been once touched by the episodes, background music, etc. in them. For example, without the song “My heart will go on”, Titanic could not have been that successful. Have a large number of videos purchased or downloaded from iTunes in hand? How wonderful it would be if you can extract audio from iTunes M4V movies without repurchasing the songs from iTunes store again, so you can play them on any music player like iPod shuffle, iPod nano, iPod classic, iPod touch, Apple Watch, PonoPlayer, PSP, Zune, use them as ringtone for Blackberry, HTC Android Phone, etc. 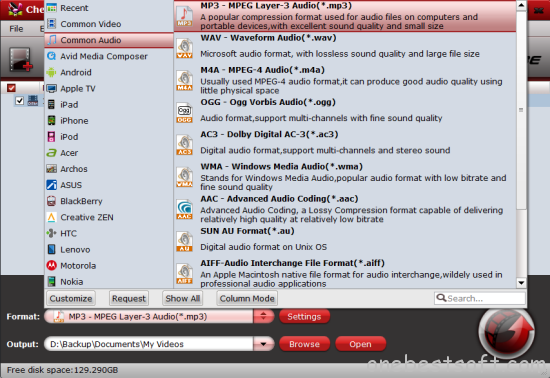 or use audio editors to add the extracted melodies to your own videos after audio processing. Unfortunately, you will find that because of Digital Right Management (DRM) protection, it is limited to enjoy iTunes movies to play on music players. What a pity! As a result, a common task that arises for end-users is to get rid of DRM (Read reason to remove DRM) and convert iTunes items to unprotected MP3 or AAC aucio formats with a DRM removal tool. Here Pavtube ChewTune (See reasons to choose it) is such an easy-to-use yet professional DRM media converter to remove DRM from both purchased and rented iTunes videos and convert iTunes M4V rentals to playable audio formats for multiple music players with high quality. Once the DRM is removed from the rentals, you are able to keep the DRM-free iTunes movies on your non-apple music players and mobiles to enjoy at anytime you like. As a wonderful iTunes DRM removal tool, it can also good at recording your authorized videos or movies downloaded from a “Digital Copy” (typically bundled with a DVD or Blu-ray Disc), Amazon Instant Video, BBC iPlayer, etc. to many other commonly used formats for viewing on practically any compatible electronic devices. Now, just learn how to extract audio from iTunes DRM M4V videos step by step. Step 1. Load your iTunes M4V movies to Pavtube ChewTune. You can either browser to file location or drag and drop source iTunes file to the app. Tip: Select the audio files you want to join together and then tick “Merge into one file” on the main interface to combine separate audio files into one. Step 2. Just click the “Format” > “Common Audio”, then you will see all the audio formats (AC3, MP3, FLAC, WAV, M4A) we listed and others. Step 3. If necessary, you could set audio parameters such as audio codec, bitrate, Sample Rate, Channels, etc so that better audio quality can be transferred to your audio players. Step 4. Hit the “Convert” button to start iTunes M4V to MP3/AAC recording. Since Pavtube ChewTune records source DRM videos in 1:1 audio quality, it would take as long as the source movie length for the whole DRM video conversion process. Once it completes, open output folder, locate the created converted file for transferring to iPod shuffle, iPod nano, iPod classic, iPod touch, Apple Watch, PonoPlayer, PSP, Zune, Blackberry, HTC Android Phone, etc..
Now you have unlocked DRM Protection and extract audio from iTunes Movies with simple steps. Step 1. Launch iTunes and go to Preferences window. For Mac: Navigate “iTunes > Preferences”. Step 2. Go to General tab and click “Import Settings”. Step 3. 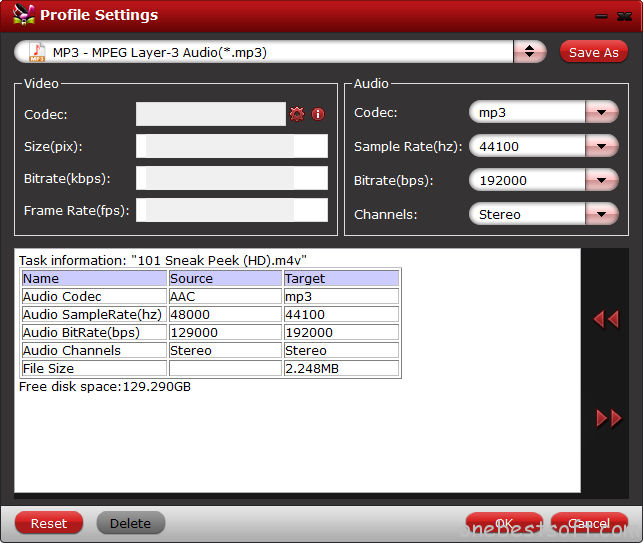 Go to “Import Using” to select “MP3 Encoder”. Step 4. Select the audio in iTunes library, right-click it and choose “Create MP3 Version” from the menu. Compared with other audio file formats, MP3 has its own distinct advantages such as no quality loss after converting. To convert iTunes .m4v video (or others from iTunes) to .mp3 is really a wise option. Note: This method can only be applied to convert iTunes purchased/downloaded audio. Besides, iTunes cannot ensure 100% success in iTunes to MP3 converting. For more convenience and greater success, go back to Pavtube ChewTune. Just start your conversion right now and experience the converted audio files on your non-apple music players and mobiles in high audio quality or share with your friends with ease. Good Luck!